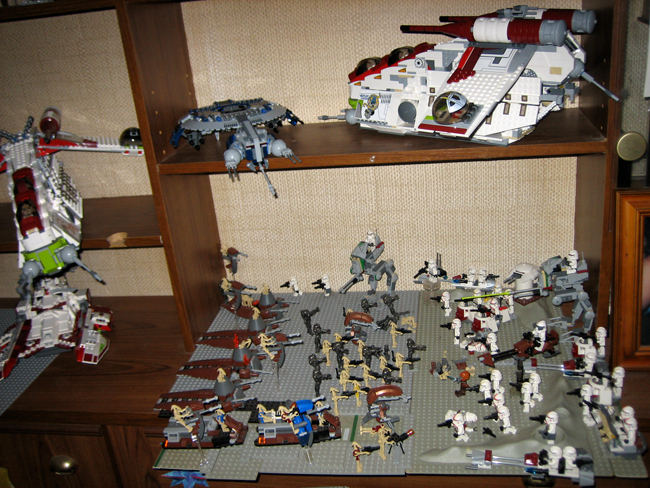 Posted: Fri Nov 14, 2008 8:10 pm Post subject: What the heck do I do with �359.92 worth of Lego?! Blimey, where do I begin? Today, a close family friend who we have known for many years jetted off to work in Japan. He's made a business deal that will see him working in the country for a good three years. Cutting to the chase - he left me (and the rest of my family) a load of gifts worth hundreds of pounds. None of us wanted to accept them but he just said "Count them as your birthday & Christmas gifts for the next few years - seeing as I'm not coming back for a while". My gifts were in two large cardboard boxes that were sealed with tape. I took them home and got to work on opening them about 20mins later. Now, I thought I could hear some Lego rolling around but nothing could prepare me for what I was about to find. Stuck to box 1 was an envelope and inside was a letter. It said "According to what I've read on the internet, you lot like to buy multiples and make armies?! Well, it's far gone from my days with Airfix models but what the heck - this'll give you a kick start to your Clone Wars collection seeing as you don't have anything. Enjoy! P.S. If there's anything extra you want, use the �30 worth of gift vouchers included with this letter to bulk up your Clone Army. Equally, if you want to return anything then just use the receipts (also included with this letter). Just remember to return the gift vouchers with the products." So, what on earth do I do with this? As you know, back in October I said I was very lucky (considering the financial crisis) to be able to afford �17.98 worth of Lego in the Woolworths 3 for 2 offer when it was on (I bought two IJ sets and a Rebel Scout Speeder). To suddenly get all this is.....well, just crazy. I missed the original Republic Gunship & the original AT-TE when they first came out during Episode II and to suddenly have the new ones now with such ease doesn't feel right. My chase is for them is over yet I did nothing to earn them. 1. Shall I take any of these back? Like, I don't need all this do I? 2. I suppose there's no better time to learn how to modify a Lego set than now. Has anyone modified their Gunship or AT-TE? I'm seriously considering taking it all back, getting a full refund and sending the money back somehow. There are times in life when you just can't accept such gifts. That money could be given to charity or donated to aid the people of Africa. I'm sure you understand what I'm saying here. This is about me and my morals. This is my good-side. The side of me that says no to greed. I'd hate to be rich. Imagine getting everything you wanted with a click of your fingers. I myself would get bored with not feeling the rewards of hard work and effort. All items were bought in Argos during a Lego Star Wars sale. Free �10 gift voucher issued (due to store promotion). Free �5 Gift Voucher Issued (due to store promotion). Well... let me be the first to say: Pics or it didn't happen! If dude gave 'em to you as a gift, and you like LEGO, then ya keep 'em. Sending 'em back or reselling would be tacky and kinda rude, imo. Maybe keep one of each for yourself and give one of each to that perfect girlfriend of yours who loves LEGO, too. If you don't want them, I take donations. From the apparent guilt you feel accepting these as a present, it seems to me like you're an awful good and kind person who would rather see $20 spent on someone who needs it more than on a nice dinner for yourself. To those who do the most good come the greatest rewards. I don't think that you in any way don't deserve these. Now, whether you need two of everything is up to you, but i don't think its greedy if you do keep them all. They were a gift. Enjoy them. I collect, but i never play with mine or build armies or anything, so i have no reason to buy two of anything for myself. But thats just me and thats why. I still buy the occasional set for my son as well (oh he's still quite spoiled i think). What you prefer is totally different tho. It's all up to you in the end, but you sounds like you highly deserve it. I spent $331 on all the new CW sets (didn't buy the AT-TE again. ), and i don't feel any guilt... In fact i think i did some good bargain shopping. These where a gift to you. Enjoy them and always remember that someone did something this nice for you. I know to me knowing that the person I gave a gift like this to enjoyed it would be the greatest thank you I could recieve. The phrase,� Never look a gift horse in the mouth� comes to mind. First off, they were all bought cheap, so it'd be silly to return them, you'd never get top dollar with just the receits. Total rewtail value there is �480, not including the �30 in vouchers. Second, if you really have no idea what to do with them, I'd love an AT-TE free of charge. Third, and in all seriousness, keep them all. You've got some fantastic sets and a bunch of vouchers to spend on whatever or whoever you wish. Keep that in mind as there's less than 2 months until Christmas. I don't recomend you open all the sets, perhaps one of each, or maybe just the ones you really want. The rest you can spend more time to decide on. Do you want to be a parts monkey, would you like to give a set to a close, younger relative for Xmas or Bday, how about just keeping them boxed up until the value is spiked so high it's stupid and then sell one of them, possibly even sell one or two of them and turn in the cash to Children in Need. These were a gift to you, and a very generous one at that, whether you deserved it or not, considering the value of it all it does seem just a bit rude to find an excuse to chuck them. Keep them, cherish them, remeber who gave them to you and you'll think of something eventually. Lucky you, but still, to echo Donald Q. Keep them and make a donation to charity yourself. The person that has done this for you has made the effort to know what you like and create a special gift for you. If I was them and found out they'd all been returned ... even if the money went to charity ... I'd be slightly offended. And then be happy that you have such a great friend. Keep them - your friend gave them to you. You didn't ask for them, nor steal them - your friend's generosity is what gave you them, and in a way, spurning it isn't nice either. Open one of each set, and maybe sell/return the second to buy other sets? Or of the sets you like open both. Personally, I'd open both Gunships & AT-TEs and return one of the V-19s and Magnaguards. You'll then have just under �70 + �30 in vouchers to get some other stuff. You could sell a few sets and use the money to send your family friend a Christmas hamper. I would keep them. As people have already said, it's not like you stole them or pressured your friend to get them. 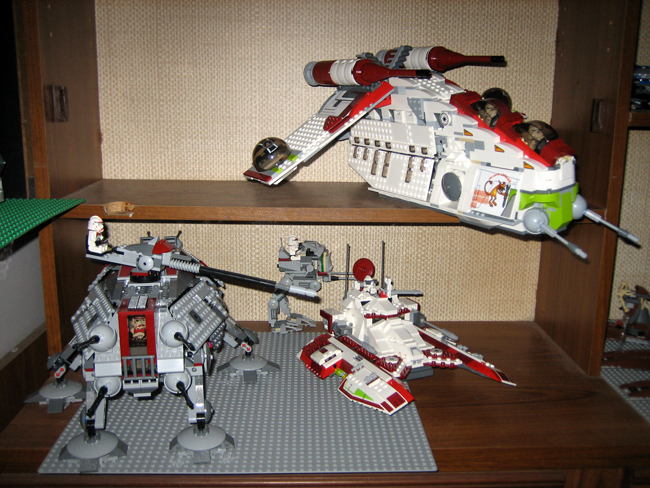 Although if you feel guilty, I accept donations of Clone Wars sets. I would keep them as well. I would keep one of each fully bult, and the multiples use for just building for fun. Or give it to a fellow Doctor Who fan who needs help constructing a certain super-laser.... Er, you didn't hear that, right? But don't throw it away! Dude! Get over the guilt, build them and have fun. With what you got there, you can make two awesome dioramas: "Clones on the warpath" and "V-19 Squadron take on the P-38's"
Imagine the possibilities. Enjoy the windfall! If you really want to help people that need the money then don't get rid of them yet. Hold on to them for a few years and sell that stuff on ebay. You'll earn way more money to give away. And since the money goes to charity you'll feel better about scalping. Yeah, they were gifts, and should be enjoyed as such. He obviously put some thought into giving you multiples for a specific reason, which means that there's something there. You shouldn't jab at a nice gesture like that by selling them of. Do you mean he shouldn't? You wrote should. Right, I've taken a couple of pics and have asked Andi to post them for me later on (because I'm a noob with photo sharing websites at the moment ). Yesterday, I sold the two Magnaguard Starfighters to a friend because he is hoping to build a large Separatist MOC in the next month or so and doesn't live near an Argos to take advantage of the offers. If I change my mind and decide to have one of them back, then he'll happily swap. I'm more of a Republic fan than a Separatist anyway. I uploaded the two photos from Master to my Brickshelf account. Master, enjoy your Lego, and if one day you want to upload a picture by yourself, don't hesitate to ask me for instruction. I wouldn't type all that stuff in the first post for nothing! That would be a waste of my time. I assume then (from what dWhisper said) that you've had people post stories in the past which turned out to be false? What's the point in doing that? To big themselves up? I really like what dW said. It was a gift, and seems kinda rude to just sell off half of it. I would keep them cause of that reason. What you do with them, that's up to you, but I wouldn't sell them. At its best, gift-giving is as much about the person giving as it is the person receiving. This gift is an act by an individual (your friend) to give another you something you wouldn't normally be able to buy. He went through time and thought to decide how this would please you. He derives pleasure from the his imagined result of your pleasure of owning these sets. Generosity is not something to be frowned upon. There is the rare case that someone wants to manipulate another by bestowing gifts or favors. If your friend is like that then you can refuse. This does not sound like this is the case. It would actually be very selfish of you to refuse the gift. Think about it from your friend's perspective. He can't use these items anymore and he probably was very excited to give you such a magnanimous gift. If you went through the trouble to think about someone else and go through the trouble of giving them something that would blow them away, you'd probably be very upset that the other person would refuse. You might think it's greedy to keep them, but it's actually greedy to refuse. You're hoarding your conception of "earning". That kind of grasping attachment to the idea of "earning" distorts the idea (your friend's) of "true giving". Your friend really wants you to have this stuff. Be amazed. Be grateful. But by all means don't let guilt ruin a beautiful gesture. I assume then (from what dWhisper said) that you've had people post stories in the past which turned out to be false? I don't think any have ever turned out exactly like that, and there have been similar threads on a completely different level. Anyone remember conan and his �600? What's the point in doing that? To big themselves up? Wait, what's this thread about then? You can't honestly have me believe you posted this because you wanted us to tell you which ones you want to keep. That would be absurd, you know yourself better than us....I assume. I'm sure you didn't need us to suggest building a clone army, considering your "family friend" already suggested that. So yeah, all this thread is doing is having you tell the world how much free stuff you got, and how you are such a good person for considering donating it to charity. Do whatever you want, that seems pretty obvious. In just about every "hey, check out what I found" thread, there are typically 2-3 more latch-ons that talk about something amazing and fantastic that they found. You can look almost all over the place here and find it, sadly. It's not really a reflection on you, truth be told, but just on the history we've had as a forum. Lots of kids. Less truth. There's a lot of good advice in this thread. You have options ranging from "keep it all and enjoy" to "give it all to me!" I think there's something to be said about receiving a gift (or compliment) graciously. While it's never good to be so full of yourself that you feel entitled to any gifts and praise you receive, being so humble that you refuse any compliments or gifts that others choose to give you shows a lack of social grace or a lack of self-consideration. I think it's great that you recognize the gap between your present "gifted" situation and the extreme poverty that others suffer. However, you need to recognize the spirit and character of your family friend's gift to you. He saw your love for Lego and (probably) your struggle to acquire. He went far beyond what you dreamed of, didn't he? While I don't know exactly what I'd do if I were in your situation, I hope that you will think through your options carefully. I imagine that I would be inspired to pass on my good fortune, either by selling one of the sets and donating the proceeds or giving the set itself to a charity (Salvation Army or some organization that gives out Christmas toys to children in need) or seeking out a child in need who would enjoy it (around here we have "Angel Tree" programs that give gifts to children of prison inmates on behalf of the parents). Rejoice in your good fortune- don't wallow in it- and remember to pass on a blessing to someone else. Well, the first post was me telling you all how shocked I was that someone would give such huge load of Lego to me as a gift. I wasn't bragging. I've never seen anyone else on here get so many sets for free before so surely this is a story worth posting? Sorry if you're jealous but it's not my fault I got all that at no expense. Dave, you must be telepathic! Today, I looked into Christmas charities and found one that I had donated to in the past (as a school kid). Back then, I grabbed a box and filled it with gifts, special treats and items that you use on a daily basis (e.g. toothbrush, toothpaste, comb, soap). I've now made plans to donate the money from the two Magnaguard Starfighters I sold to that charity. It's called Operation Christmas Child. It's a brilliant organisation and they work so hard to bring happiness to kids who have very little. I wasn't bragging. I've never seen anyone else on here get so many sets for free before so surely this is a story worth posting? Sorry if you're jealous but it's not my fault I got all that at no expense. Allow me to rephrase this quote, is this what you're saying? "I don't think anyone has ever received this many sets for free, I have a feeling you're jealous." Yeah, The Master, it sounds a lot like all you're really doing here is bragging.